As the name implies, there is no added sugar in these cereals. They are made with wholesome ingredients like carrot, apple, raisins, walnuts, and more. 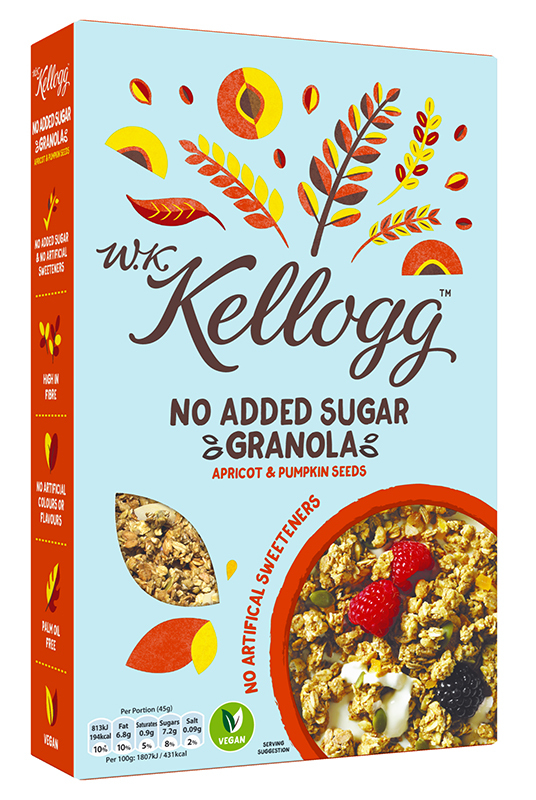 The “No Sugar Added” line includes No Sugar Added Granolas in the flavors Apricot & Pumpkin Seeds and Coconut Cashew & Almond. There are also the Organic Wholegrain Wheats in the flavors Original and Raisin. Lastly, there’s a Super Grains Granola in the flavors Cranberry and Sultana & Spelt. These cereals are currently available in the UK and are hopefully just the start to more similar plant-based, healthy products. Are you searching for a sugar- and oil-free granola recipe that does not have an overwhelming list of ingredients? This easy and tasty Cinnamon Crunch Granola by Melanie Jacobs is much better (and healthier) than all those boxed varieties from the store. Looking for a change from your oats or smoothie for breakfast? Have a bowl of this Orange, Ginger, and Fig Granola by Tiana Haines with some fruit and homemade almond milk or on top of a smoothie bowl for extra goodness! Claire Ragozzino‘s Maple Spice Granola recipe versatile and easy to modify flavor combinations using a variety of fruits and nuts to shift the seasonal focus – think chocolate/cherry, banana/walnut, coconut/apricot and more. This variety uses warming spices and mix of fresh apples and dried cherries. We hope you enjoy these delicious granola recipes. For more, download our Food Monster App where we have over 15,000 vegan and allergy-friendly recipes!